EaseUS Disk Copy is a potent free hard disk clone software providing built-in burning software to copy/clone hard drive or partition sector by sector regardless of operating system, file systems and partition scheme. The sector to sector method assures you a copy identical to the original. It can be used for backup, cloning, or upgrading small hard drive to a new drive, even cloning deleted, lost or inaccessible data from old hard drive for data recovery. Major Features: 1. 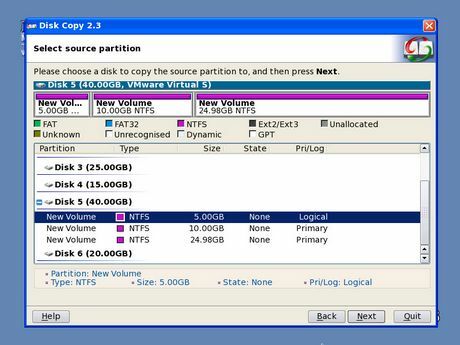 Copy/clone disk to upgrade disk or backup data. 2. Data clone (compatible with all hard drives) for data recovery. 3. Sector to sector copy to ensure 100% identity to the original. 4. Supports Partition Copy & Disk Copy. 5. Supports SATAI, SATAII, SCSI, Fire wire (IEEE1394) and USB. 6. Supports inaccessible disk copy. 7. Relay disk space for insufficient destination. 8. Support hard disks up to 1 TB. 9. Safe, simple and fast! New Features: 1. Built-in burning software. 2. Friendly graphical user interface. Need some help backing up your Outlook Express e-mail accounts? This tool lets you back up messages, account settings, general settings, signatures, rules, and a list of block senders. Perfect for hassle-free e-mail data transfer. This program makes a reserve copy of your critical data to hard or USB drives, CD, DVD and Blu Ray media, FTP server or LAN. 128-bit encryption and multichoice ZIP compression on the fly are available to keep your backups small and secure. Recovery for Access is a data recovery program for Microsoft Access databases (.MDB). Recovery for Access has a powerful recovery engine designed to retrieve data from most damaged Access databases. Fixes databases 2.0/95/97/2000/XP/2003/2007/2010. Arctor is an easy-to-use and powerful file backup solution, offering fast, reliable backup and version management. It can quickly and easily restore your files in the event of accidental loss or hardware failures. All-Round Backup is a versatile fully-automated solution to back up and synchronize your important data to a local or external drive, Flash/USB, CD/DVD, FTP or network. All-Round Backup is a powerful yet easy-to-use tool. It makes a mirror of your important information and keeps it actual. It works as a background process. It also can be used for synchronizing your home computer's and notebook's working files. This site does not contain serial number, crack, keygen EaseUS Disk Copy Home Edition serial number : serial number is the simplest type of crack. A serial number(cdkey,product key,etc) is register the program as you may already know. a crack or keygen may contain harmful software. If you cannot find the exact version you want, just give it a try. for more information read .nfo/.txt/.diz file include in zipped file.